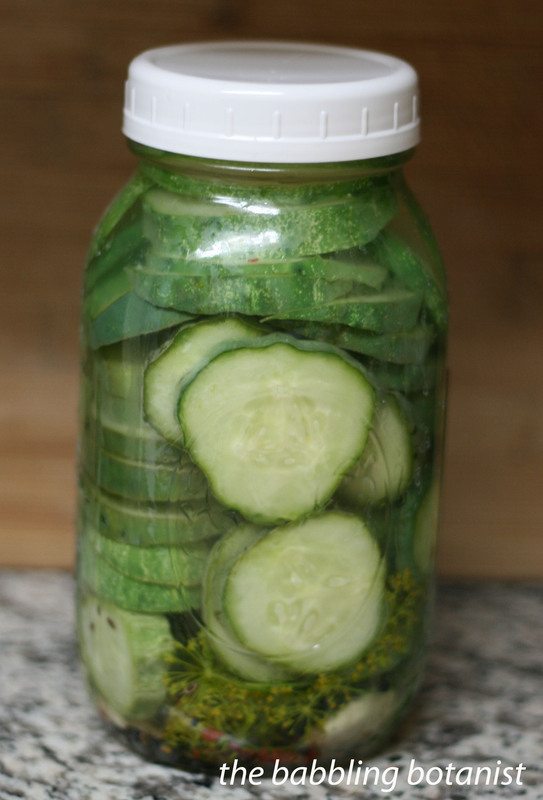 The beginning and end of pickle season is the perfect time for making refrigerator pickles. My pickling cucumbers are starting to come in, but not in such huge numbers that I want to pull out the canner and process them, so the refrigerator pickle is really the way to go. These pickles also have the benefit of being so quick to make, and are often the crispest pickles you’ll have all year, since they don’t get processed in the canner. This recipe is sort of from Ball, but I do it a bit differently, so you are also welcome to check out their recipe if you prefer. 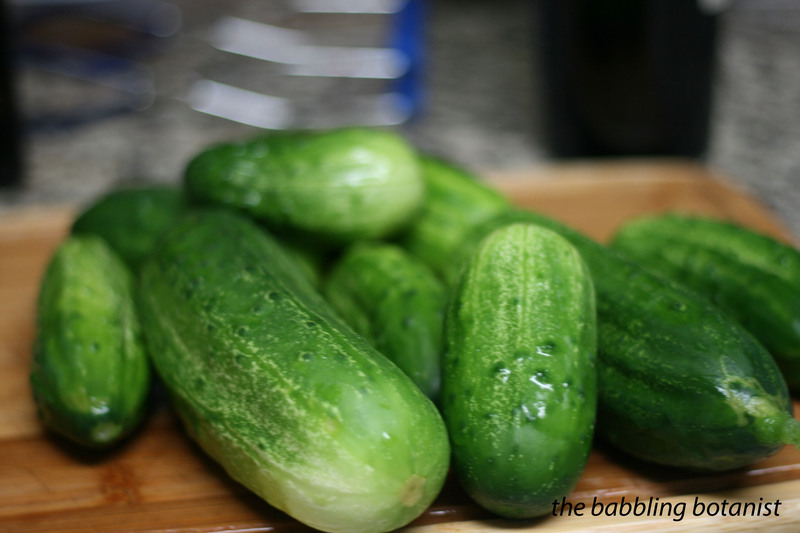 Pick your cucumbers, wash them and make the pickles as soon as possible for the crispest pickles. Always remove a slice off the blossom end, because it contains enzymes that can soften your pickles. Slice your cucumbers however you desire. If you do spears or try and do whole cucumbers you will use more brine than if you do slices and pack them tightly of course, so usually I cut up my cucs to see about how much I have, then make a little extra brine just in case. Combine the water, vinegar and salt in a saucepan and bring to a boil to dissolve the salt. If you want your pickles a little sweeter, add a tablespoon of sugar too. Remove from heat. Heat your jars up a bit so they don’t break when you add in the brine. I just wash them in really hot tap water then leave them full of hot water while I get out the spices and peel the garlic. Then, empty the water. In each jar place whatever spices you desire. My ingredient list is what I do, but feel free to explore. Use the ratios provided of vinegar, water and salt, but do whatever you like with the spices. Don’t like garlic? (you’re crazy!!) then don’t add any. Want it really dilly? 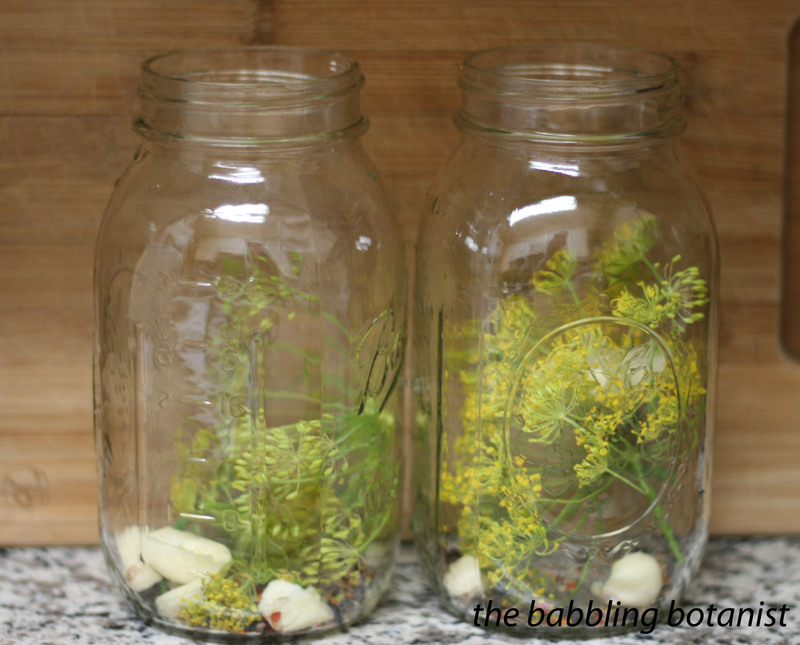 Add more heads of dill, or use both fresh and seeds. Want it spicy? Add a tsp or so of red pepper flakes. Have a pre-mixed pickling spice? Great, just use a tablespoon or so of that. Fill the cucumbers into the jars, packing them in fairly tightly. Pour the brine into the jars to cover the cucumbers. Just make sure you either let the brine cool a little, and/or have nice warm jars still, because otherwise you could have jar breakage. The alternative (how Ball does it) is to heat up the brine with some spices in it, then throw the cucumbers in there after boiling it and let that cool to room temperature, then fill the jars. Your choice. If you did it my way, let the jars cool to room temperature, about a half hour or so, then refrigerate. I like to give the jars a bit of a shake a few times too, to distribute the spices more. You can also shake it up a bit every couple days, but it’s not essential. Enjoy the pickles after waiting 2 weeks, and within about 3 months of making them for best quality. 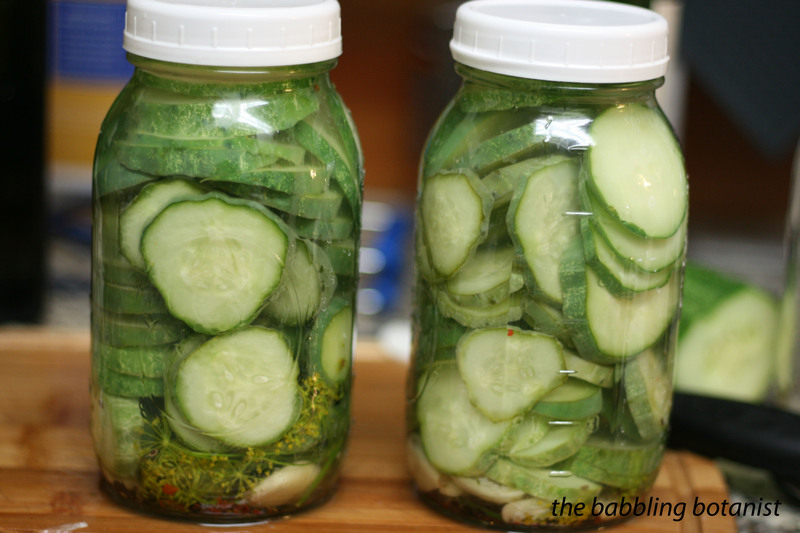 Last year I made some refrigerator dill pickles and did not find them to have much flavor. I’m not sure if I used the Ball recipe or not, I’ll check my file. This recipe sounds good though, so now I have another one to use as soon as I harvest another batch of cucumbers from the garden. I’ll definitely be adding the garlic. What’s a pickle without garlic? I so agree about the garlic, some recipes list it as optional and that’s just crazy. I could see that maybe they don’t get as much flavour since they don’t boil in the brine like when you process them, which is why it’s nice to add the brine hot and at least they can soak for a short time in hot or warm brine. Or you could even boil the spices in the brine to maybe soak in the flavour more. I do love how crisp they stay is way though! I’m anxious to try your recipe. I made some sweet refrigerator pickles last year and although I don’t like sweet pickles I gave them to my father who does and he said they were the best sweet pickles he’d ever had. They were crisp and perfect. Now hopefully I’ve got a great dill refrigerator pickle to add to my recipe book of “keepers.” I’ll let you know. Made these last year and am getting ready again this year! !